it might almost be said that a man in the firing line first thinks of his cartridges and the very next thing he seems to worry about is ammunition for his pipe. The pipe itself is only less precious than the rifle. Those soldiers who smoked were often described as “devotees at the shrine of Our Lady Nicotine”, or in the case of Orange railway clerk Jack Earls: “a solid worshipper at the shrine of My Lady Nicotine”. Soldiers departing for overseas service were generally given a farewell gift which invariably included cigarettes. When 24 local lads left Orange for embarkation in Sydney in September 1915 they were each presented with a large packet of Three Castles cigarettes and a pocket testament. 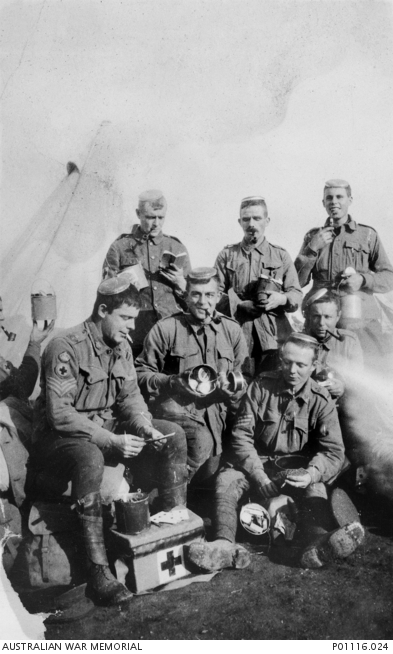 Cigarettes and/or tobacco were often issued as part of a soldier’s rations. 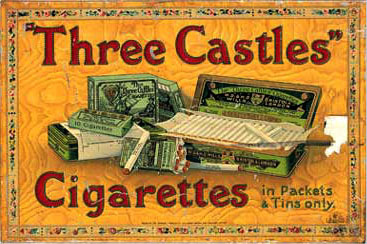 Charitable organisations such as the YMCA and Red Cross Society ensured that troops received a steady supply of cigarettes and tobacco. In January 1917 James Anderson Murdoch, a volunteer with the Australian branch of the British Red Cross Society affirmed that the Red Cross distributed 250,000 cigarettes a week to Australian troops, and the demand was visibly increasing. “Cigarettes”, he claimed, were “the most acceptable portion of the Red Cross distribution”, followed by Australian newspapers. 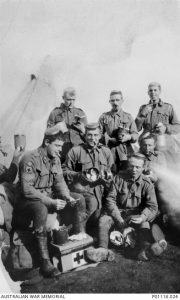 We had roast beef and potatoes, plum pudding, also preserved fruits for our dinner… We had a packet each from the Comforts Fund of NSW, which contained pipe, cigarettes, lollies, matches, chewing gum, handkerchief, writing paper and matchbox holder. Members of the 4th Australian Field Ambulance display their Christmas billies, 1916. The billies contained foodstuffs and a pipe. Some of the men are wearing the billy lid on their head. Image courtesy Australian War Memorial. Later that month a Pipe and Tobacco Dance was held at the Oddfellow’s Hall; attendees were advised to supply at least four packets of cigarettes. Despite being “not as largely attended as was anticipated”, the event raised 2,010 cigarettes, 12 medium tins of tobacco, one large tin of Vice Regal tobacco, and one pound of tobacco. The following month Mrs Elder of Anson Street hosted a fundraiser and collected 58 tins of tobacco, eight packets of cigarettes and 46 cakes of soap for the district’s soldiers. Children were also encouraged to help supply cigarettes for soldiers. In June 1917 schoolchildren from Lewis Ponds sent a comfort package containing predominantly cigarettes and tobacco. It is the duty of every man and woman at home to see to it that there is a plentiful supply [of cigarettes for soldiers]. 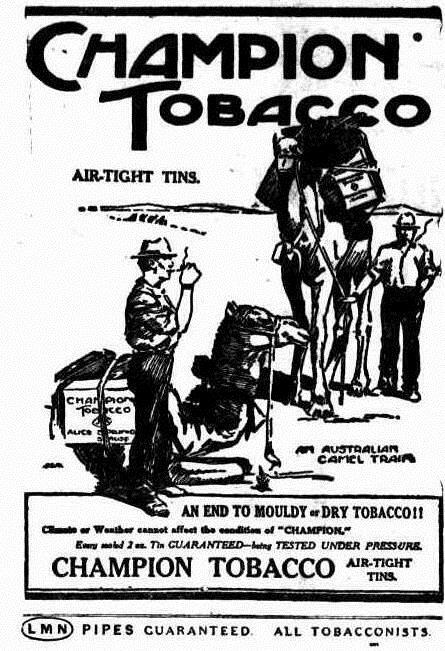 For just one shilling the Fund (authorised by the State War Council) will keep a soldier in tobacco for one week. Soldiers smoked for many reasons. Smoking helped to relieve boredom and pass the time during the long stretches of relative quiet and waiting at the front. The smell of smoke undoubtedly masked the stench of death and the squalor of the trenches. Smoking provided a chance to momentarily escape, to take time out from the daily horrors of the battlefront. It created a sense of camaraderie, boosted morale and helped to relieve stress. During the Christmas truce of 1914 German and British soldiers left their trenches to fraternise and share a smoke with the enemy. 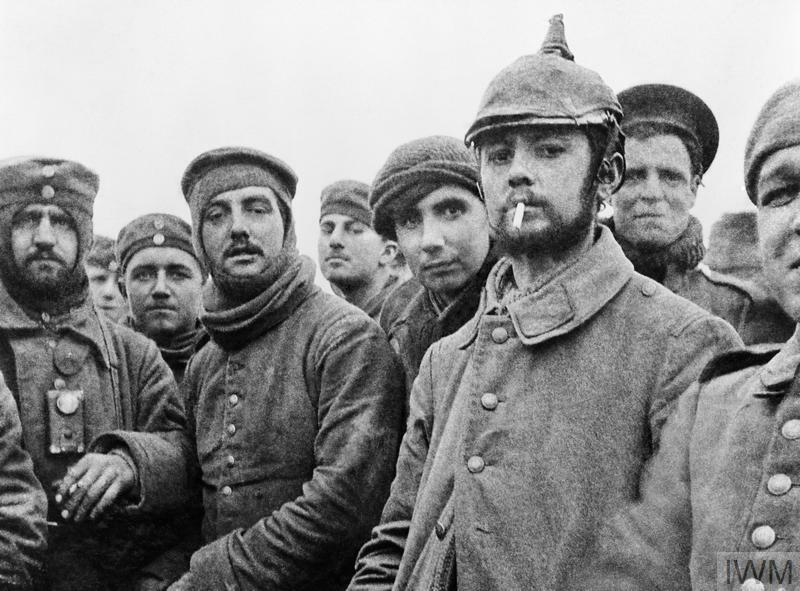 British and German soldiers fraternising at Ploegsteert, Belgium, on Christmas Day 1914. Image courtesy Imperial War Museum © IWM (Q 11745). The nurses are very good to you. They fetch cigarettes and matches to you. I had a very narrow escape, it was a packet of cigarettes that saved me, if not from being killed at least from serious injury. I was opening a packet of cigarettes at the time (holding my hands in front of my body as I did so) when the bullet went through my hand, through the cigarettes, through five thicknesses of my tunic, made a hole in my shirt and hit me in the stomach, taking some skin off and making a large bruise, and also winded me. Did you get the cigarette packet I sent you, with the shrapnel wound in it? There is a bit of my blood on it, which I want again when I return. According to a recent World Health Organization (WHO) study more people died during WWI as a result of smoking than were killed in action or died of wounds. Gleams white to the kiss of the sun. And my troubles soon vanish in smoke. Then form a platoon by the Nile. But Anthony sees me and curses. And promptly I call for a beer. And sentries I place at the doors. When somebody shouts in my ear. I awake and struggle to rise. And the loafer, alas! it is me. Carries wishes from Catherine McBride. Cigarettes or war: which is the biggest killer? This entry was posted on July 4th, 2017.